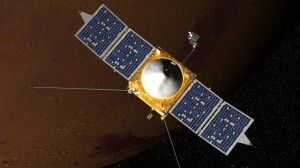 LASP is the NASA Mars Atmosphere and Volatile Evolution (MAVEN) mission lead for Education and Public Outreach (E/PO). Join as we explore Mars’ climate history with MAVEN! For individual program offerings, including professional development workshops, formal and informal education programming, and outreach opportunities, please visit the MAVEN website at http://lasp.colorado.edu/home/maven. We are also focused on the use of social media for education and outreach; connect with MAVEN on Facebook and Twitter.